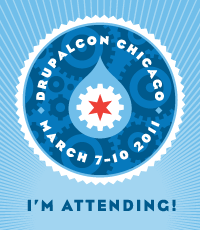 I became interested in VPS.NET when they sponsored DrupalCon Chicago last March. It was nice to know they were adding a node so geographically close to me, and fun to watch how many exhibits they could get the VPS.NET robot into. I have had mine on my desk(unless the office cats knock it off) as a reminder to check back for deals and remind me if the need arose. Once I had the redundancy and individuality of the VPS.NET node I was wondering what else I could do. It wouldn't be detrimental to have to reboot the node. Oh yea IPv6. I have been trying to get IPv6 running for all my services. I've been reading about the government mandates to be dual stack, but I recently read the next step will be removing IPv4 and going IPv6 only(no time line of course). I started researching 6in4 and 6to4 tunnels with ping and traceroute handy. I found the 6to4 anycast address was 192.88.99.1 and I found the closest 192.88.99.1 was 3ms away, but tunnelbroker.net's Chicago router was only 1.88ms away. I've had customer's ask as they have heard of legislation. I assured them they weren't affected but would love to tell them we already support IPv6. I setup the tunnels and my first IPv6 name server is a VPS.NET node. I tweeted @vpsnet and they were quick to respond with “We should have native support in the next few months” I look forward to native IPv6 on my name server node. Just a note CentOS 5 doesn't have a statefull ip6table. It won't provide errors it just won't work.